This organic protein is great after tough workouts. Love this. Will buy more. 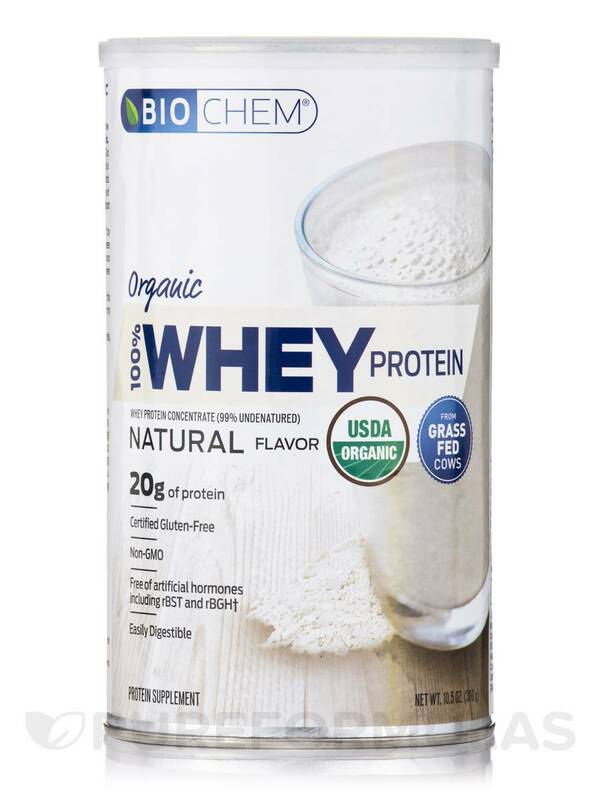 Organic 100% Whey Protein Powder (Natural Flavor) from BioChem Sports® may be a rich source of whey proteins. The cheese-making process has a watery by-product called whey‚ which is rich in proteins called whey protein. Whey protein‚ as provided by the supplement from BioChem Sports® might support and promote muscle development. The whey used here is fat free and rich in peptides and may also provide minerals like calcium‚ phosphorous‚ magnesium‚ and potassium that are essential for health. Calcium is known to support bone health‚ while phosphorous and magnesium could support bone and muscular health. Potassium is known to support cardiovascular health. 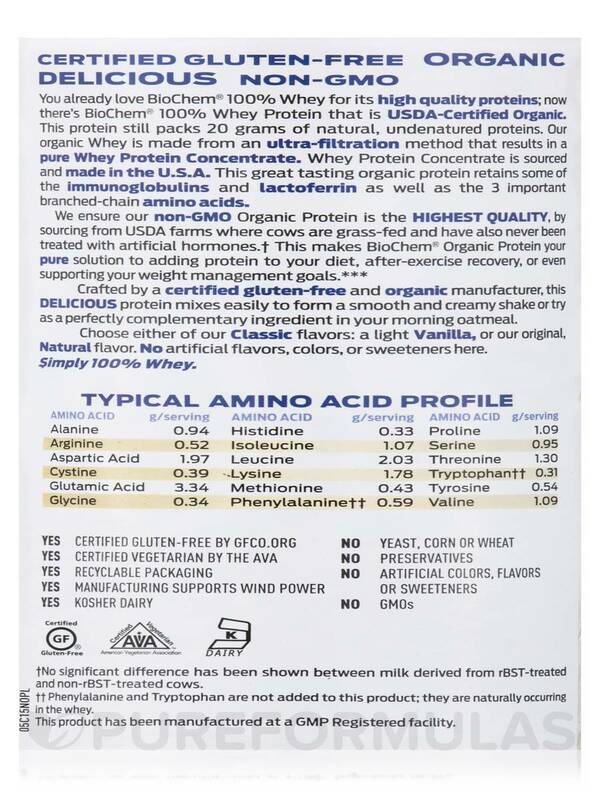 Whey protein is also a natural source of Branched-chain amino acids (BCAAs) like isoleucine‚ leucine‚ and valine. These BCAAs are essential nutrients usually obtained from foods like dairy products and legumes. BCAAs may fuel the building of protein in muscles and may also reduce protein breakdown in the muscles. Organic 100% Whey Protein Powder (Natural Flavor) from BioChem Sports® ensures a high quality product that is produced using a micro-filtration process. *Percent Daily Values are based on a 2‚000 calorie diet. 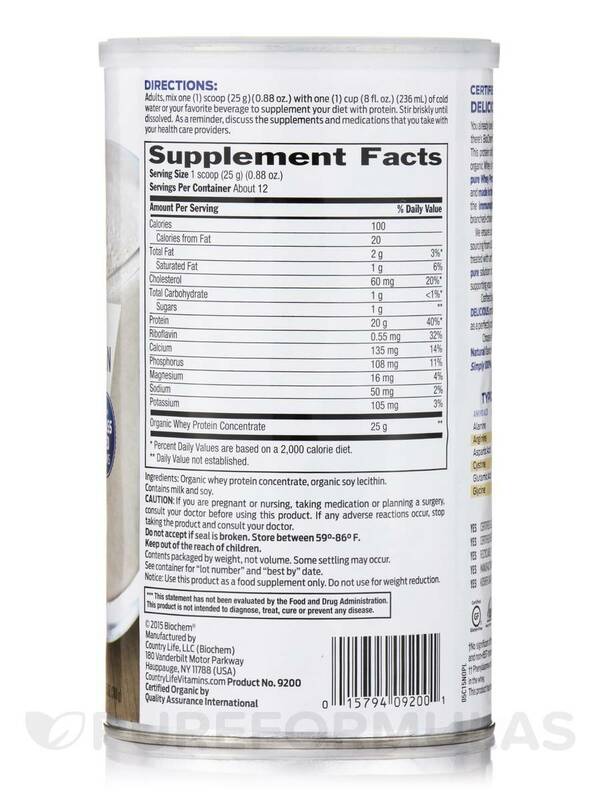 Ingredients: Organic whey protein concentrate‚ organic soy lecithin. 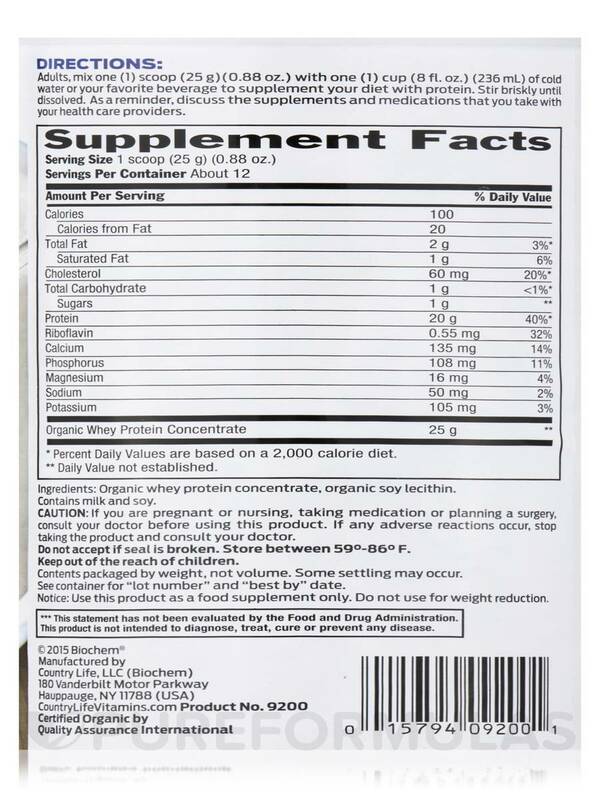 ††Phenylalanine and Tryptophan are not added to this product; they are naturally occurring in the whey. Yeast-Free / Corn-Free / Wheat-Free / Preservative-Free / No Artificial colors‚ flavors or sweeteners / Non-GMO / Gluten-Free / Vegetarian / USDA Organic / Kosher. 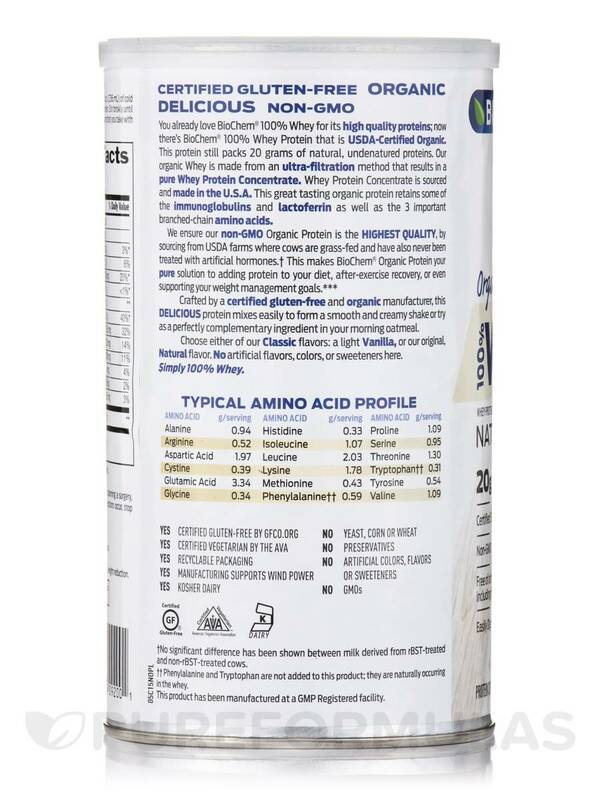 Free of artificial hormones including rBST and rBGH. This product has been manufactured at a GMP Registered Facility. Adults‚ mix one (1) scoop (25 Grams) (0.88 oz) with one (1) cup (8 fl. oz) (236 ml) of cold water or your favorite beverage to supplement your diet with protein. Stir briskly until dissolved. As a reminder‚ discuss the supplements and medications that you take with your healthcare providers. If you are pregnant or nursing‚ taking medication or planning a surgery‚ consult your doctor before using this product. If any adverse reactions occur‚ stop taking the product and consult your doctor. Do not accept if seal is broken. Use this product as a food supplement only. Do not use for weight reduction. Notice: Contents are packaged by weight‚ not volume. Some settling may occur. Allergen Caution: Contains Milk and Soy. I have tried them all and I prefer this 100% Whey Organic Protein Powder, Natural Flavor by Biochem Sports easily digestible protein. It tastes best! Organic 100% Whey Protein Powder by Biochem Sports has a decent tasting, inexpensive protein supplement. It's good for mixing in smoothies. Not really suitable as a meal replacement used alone, but good for between meals to reduce hunger cravings, or for post workout recovery. Not bad! I believe that nutritional supplements saved my life. I've tried a lot of products, and I know what works and what doesn't. My reviews are honest, straightforward, and based on my experience. Read my other reviews to quickly learn from my three decades of research and experimentation.